W2P from A to O. A round up of W2P offerings for digital print providers.. Properly implemented W2P solutions enable streamlined ordering and improved workflow efficiency. Functions vary greatly, and the best solution for a specific print environment depends on many factors including ease of use, cost effectiveness, and feature sets needed up front and in the near future. 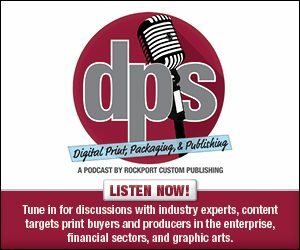 The January issue of DPS Magazine provides four print providers that benefit from a W2P implementation. Here we provide a look at W2P offerings on the market and their competitive differences. AccuraMIS provides a W2P solution called AccuraOnline. This system offers 24/7 online Web presence, easy customization, and site access controls by username and password. According to the company, it provides real-time synchronization, offering clients complete visibility of their work without job or subscription fees. Aleyant Pressero is touted as an easy to use, cloud-based business to business (B2B) or business to consumer (B2C) online storefront solution. It is customizable to fit each individual print provider’s needs. The addition of Aleyant DocBuilder, a Web-based data publishing system, enables Pressero to integrate into Aleyant or other third-party W2P or management information systems (MIS) to incorporate features such as typography control, imposition, scripting support, PDF workflows, rapid template creation, and Microsoft Excel merge capabilities. Amazing Print Tech provides a variety of W2P solutions featuring tools such as retail storefronts, live estimator storefronts, trade printer workflows, B2C and B2B storefronts, as well as custom W2P workflows. Available as Software as a Service (SaaS) deployments as well as licensed or self-hosted solutions, Amazing Print’s W2P system can be used either as a plug-in to a website, or replace an entire website with an SEO friendly, mobile supported customer experience. eAccess is part of Avanti’s Classic product, and is a popular module according to the company. eAccess W2P is able to fully integrate with Avanti’s Print MIS. All of its modules are customized and scaled depending on the needs of the client. Avanti offers on-site training and documentation based on a customer’s tailored eAccess system. Avanti Slingshot features full integration with leading providers of W2P solutions. This incorporates business intelligence—including customer relationship management, dashboards, and reporting; production planning—such as estimating, imposition, planned purchasing, sales orders, inventory management, and scheduling; and warehousing, shipping, and billing into one easy-to-use, easy-to-implement system. It offers built-in intelligence to guide users through the workflow, presenting information when and where it’s needed. Avanti Slingshot is browser-based, device-independent, and database agnostic. It is accessible anywhere and anytime and is available as a cloud-based offering or hosted on premises. B2CPrint provides online design and ordering functionality. It enables SaaS-based storefronts for selling a variety of print products. Features include an online estimator for print jobs, workflow management, enterprise resource planning, and thousands of graphic templates. B2CPrint caters to various segments in the printing industry including wide format, digital, labels and package, and offset printing. Cendix’s flagship product is its Channel Marketing Portal (CMP). The CMP allows channel owners to post corporate approved marketing materials—like brochures, direct mail, and logo items—online. Channel partners select items, personalize them, and route them for automated production and delivery. The channel owner can lock down the brand messages and offers while allowing partners to market using corporate approved materials. This solution preserves brand equity and reduces the cost of channel management. Cendix also offers a Mortgage Marketing and Compliance system for the mortgage banking industry. Compliant marketing materials are posted on the portal and mortgage brokers access these materials to launch campaigns. The company tracks the marketing piece, captures responses—both online and offline, and provides a complete audit trail of marketing programs. It also provides and manages credit score data to improve the quality of returns. Cendix offers these advanced tools at no charge to financial institutions when it handles production. EFI DigitalStoreFront streamlines job submission and is designed to integrate with an EFI MIS system to provide end-to-end business integration. According to the company, it increases productivity and volume without the need to increase staff or costs. EFI DigitalStoreFront is available as a cloud-based deployment model or self-hosted solution. DigitalStoreFront is easily branded for a specific client, company, or department with custom colors, logos, and products. It supports multi-language, currency, and companies, as well as providing industry-specific software development, training, and support. It also allows buyers to order and reorder jobs at their convenience, 24/7 from any location. Hybrid Software provides a set of tools for streamlining production operations, eliminating duplicate data entry and human error, and automating production to meet the latest client needs. Cloudflow is a compact and modern system for running automated production workflows in a private computing cloud. Interfaces are developed in HTML5 so workflows can be controlled from any Web browser or computing tablet. Hybrid’s FRONTDESK combines a customer-facing Web portal and automation system to allow customers to place, track, and manage all orders as well as automatically transfer them into MIS and production systems. Infigo offers products to help expand printing businesses online, from W2P and variable data software to marketing automation and online dynamic design tools. The Infigo Catfish W2P software platform is an online storefront that allows print organizations to offer new services and products. There is the option of adding templates, enabling customers to edit, manage, and submit print-ready files through an easy-to-use website. Originally created for professional printers to offer enterprise-level photobook and photo merchandise production, Infigo MegaEdit now has another distinct use an online design tool. Symphony is Infigo’s latest product. It is a scalable marketing workflow and automation solution comprised of of email, SMS, and print. It provides the ability to dynamically create campaigns.